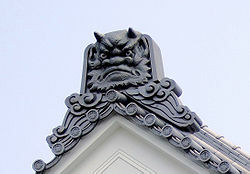 Onigawara (鬼瓦 ) are a type of Japanese ogre- or goblin- gargoyle and roof tile ornamentation found in Japanese architecture. 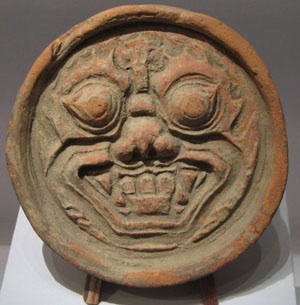 Literally translated as ‘ogre tile’, the roof tile ornaments traditionally depict a Japanese ogre (oni) or a fearsome beast, but also commonly include many other motifs such as floral (alternatively known as hanagawara 花瓦) and animal designs. Swirling or wave patterns found at the bottom right and left of the onigawara are called hire 鰭.
Onigawara are usually ceramic but may occasionally be made of stone or wood. 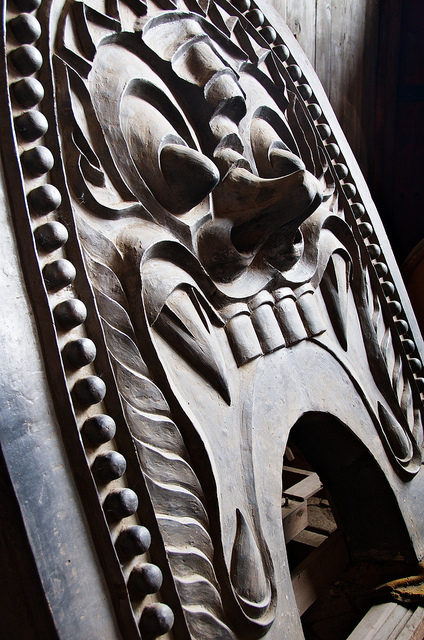 The oni goblin design motif is thought to have originated from a previous architectural element, the oni-ita, 鬼板 which is a board painted with the face of an oni and was meant to stop roof leaks. 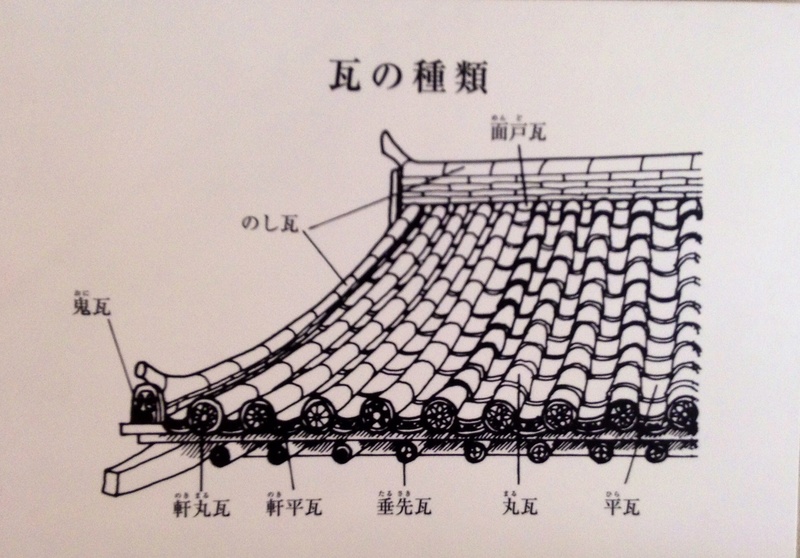 The earliest onigawara tiles are dated to the Nara Period. Onigawara are also be found decorating temples and palaces, not just shrines. The largest onigawara (World Guiness Records) made of clay, measures 9 m (29 ft 6 in) tall and 8.8 m (28 ft 10 in) wide, is found on the rooftop of the main building of Nenbutsushu Muryojuji Temple , Mikawa Bay. 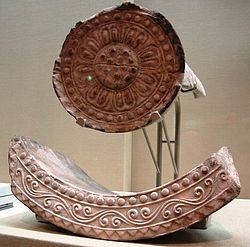 The onigawara roof tile technique may have been introduced by Korean ceramic potters as similar onigawara tiles have been excavated in Korea, but the earliest roof tiles were from the Han Dynasty China. To understand the origin and evolution of the Oni cultural figure in Japan, see Oni and their Maces: Images of Oni from Onmyodo and Medieval Traditions. Examine the unmatched kawara tile display in Kawara Museum. Located in Takahama City, which, together with neighbouring Hekinan, has been a major centre of roof-tile (kawara) production for centuries and remains the main producer of Sanshu-kawara with Japan’s top domestic output of kawara. 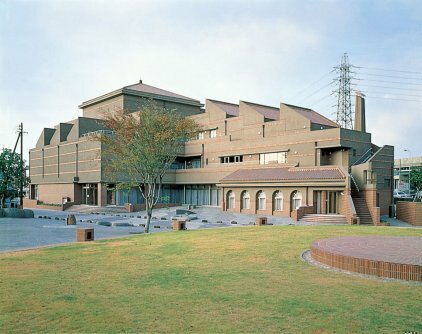 At the Kawara museum you can obtain an up-close look at the best of the region’s roof tiles, feel the beauty and appeal of kawara through the outstanding collection and exhibits of pottery products including kawara from different periods and pottery-producing regions across Japan, as well as kawara/pottery from around the world. In addition, artwork (paintings, block prints, ukiyoe – Japanese woodblock prints, calligraphy, photography, etc.) 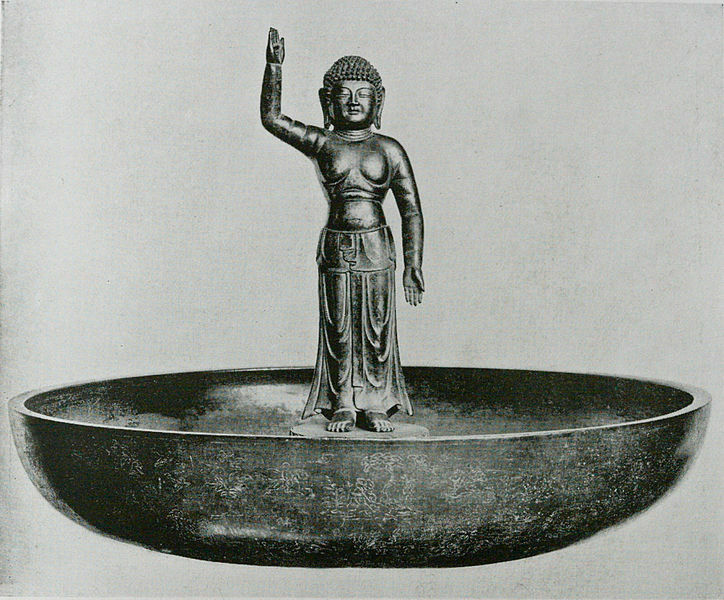 and literature related to kawara/pottery can also be viewed at the museum. Art students can find inspiration in the landscape designs and roof tile paintings as artistic motifs. Visitors can also experience the joy of hands-on pottery-making by kneading clay at the half-day workshop. To view a stunning collection of onigawara, go to the online Flicker gallery of onigawara photos, and click here. Thank you very much for the information! I am writing about the Oni-gawara for a paper for an Arts of Japan class at the University of Pennsylvania. 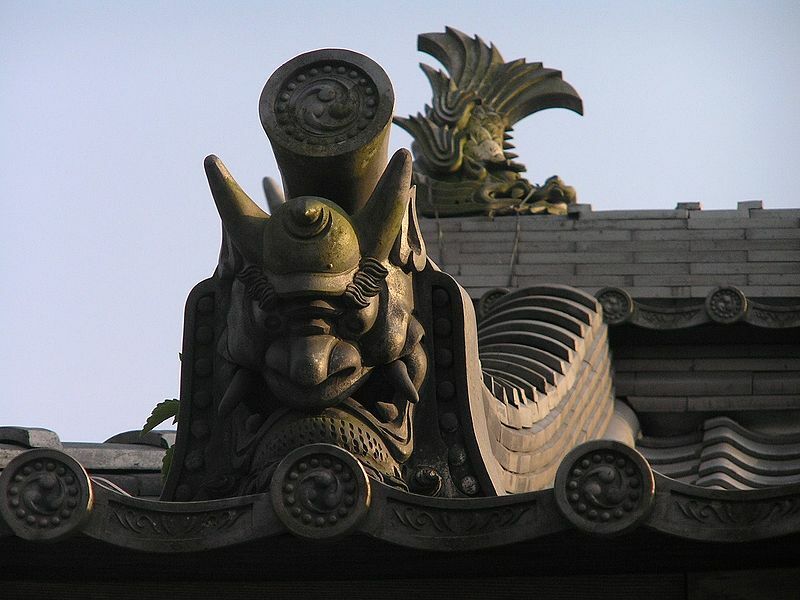 I was confronted with limited sources and found this site to be very helpful in understanding the genre and origins of Oni-gawara as an architectural element.